Webbman wrote: all the planets are pretty unique apart from being spheres. I would imagine the suns they might produce one day would be as unique as they are. I don't believe you can guess the size or age of suns by the color. If anything I would guess the sun to be very old based only on the number of planets it has and maybe the size of its largest planets. Yes, the Sun is very old, it is many tens of millions of years old, its age stretches far back to the Earth's Cretaceous-Paleogene extinction event, about 65 million years at least. Chances are though it is a tad bit older though. Relative to the other solar system objects though, it is young. I would give a rough estimate of it being about 1% the age of the Earth. would you be open to the possibility that suns both begin and end as planets. Clearly you support their deaths, and in my view any planet can be a star if it can harness the galactic current and the opposite is also true where a star can become a planet again should it fail to do this. Just so you know, I'm not trying to sound arrogant, but we absolutely NEED to always follow the conservation of mass and the conservation of energy. Establishment dogma doesn't even do that. They have stars as closed thermodynamic systems (no mass loss), regardless if young stars like the Sun are observed to be losing mass by the trillions of tons every second, due to solar wind, flaring and CMEs. To them, conservation of mass is irrelevant with regards to stellar evolution. Yet it is the most fundamental physical law. They have ignored the most fundamental physical law while drawing up their stellar evolution models. The reason I'm saying this is because stars lose mass as they evolve. The oldest stars therefore are a lot less massive than the young ones. Unless that mass is replaced, then I do not see "planets" as the 20th century definition is defined ever becoming "stars". So even IF there was a galactic electric current in a giant grid, it would never be able to make an Earth sized object into a Sun-like object. Ever. Unless the mass is replaced. Electrical current in cables and wires in our homes does not increase the mass of the cables/wires. So even if Earth should pass through one these "currents" in outer space, it would never become a Sun like star, because Sun-like stars are way more massive than Earth. The other point is that it takes extreme amounts of time for crystals to grow, as in rocks and minerals. The Sun does not have any crystals (rocks and minerals). Ipso facto the Sun is much younger than Earth, as it has no crystals. What if there were other ways for a sun to regenerate its matter. Whose to say that plasma from interstellar space is not diverted toward the sun via the heliosphere as it passes through a region, or that the mass losses from a sun are only recycled and never really leave the system. is it really a loss of mass at all? Webbman wrote: What if there were other ways for a sun to regenerate its matter. Whose to say that plasma from interstellar space is not diverted toward the sun via the heliosphere as it passes through a region, or that the mass losses from a sun are only recycled and never really leave the system. Well from what I've seen the mass is coming out of the Sun, as the solar wind only goes in one direction, out of the Sun. This instantaneously destroys the establishment's claim that the Sun is a closed system. Not only that, but we can observe stars that have lost, and continue to lose their mass. They are called orange dwarfs, red dwarfs, brown dwarfs, oceans worlds and planets (the really old stars). This is why GTSM is so powerful. We now have observations of stars in all stages of evolution. The problem rests in our culture now. It is very difficult for people to let go of the idea that "planet" and "star" are not different. Some are just more evolved than others. It is a similar cultural battle that was waged during Darwin's time. People refused to believe that we evolved from monkeys/apes. The truth is that was never the argument to begin with. The argument was that we have a common ancestor. Yet, the culture of the time refused to accept such proposition, so they picked an argument that wasn't the argument at all so that they could reject it. I think its called setting up a strawman. With this theory, the cultural "expert" argument is that stars cannot lose huge amounts of mass. Well, that's a huge problem for them now. We have observations of stars in all mass ranges all the way down to Titan. It is 100% observed that stars lose mass. The fact that we even observe these stars that have lost their mass is not the problem, the problem is that we use a 2,000 year old definition for old stars that have lost their mass. We call them planets! a shining star the size of titan would fit my model, but not yours. Not that I think you can accurately determine the size of a star from here. my model only requires that a planet be able to draw from galactic currents. Size is only relevant if another bigger star, like the sun, is preventing you from doing that. it doesn't seem like you model has much accounting for electrical processes, which really makes it no different than the mainstream model, other than how it dies. Webbman wrote: a shining star the size of titan would fit my model, but not yours. Not that I think you can accurately determine the size of a star from here. Okay, so what I'm taking from this is that in your model everything in our solar system, no matter what size, will shine strongly in the visible light spectrum if it is outside of the Sun's heliosphere, and not orbiting another object? That would mean that all the rogue Neptunes and rogue Earths/Venus's would be visible just like their hotter, sun like counterparts that are not in orbit around other stars. So to support this theory you would need to observe objects that are visibly radiant with the mass of the Earth or Neptune, that are not orbiting another star. Have any of these objects been found yet is my next question, because if they have been found then stellar metamorphosis is false. I see a universe full of stars and plasma. The only "rogue" things I see are comets which are visible No one can accurately determine the mass of a star, its size or even its distance. Sure they do it, but that doesn't mean it has any accuracy. all I'm saying is that any object placed in an electrical current can glow. It can also blow up, be ejected, be avoided, or do nothing. The entire safire project is a glowing object in an electrical current. aka star. so if birkeland currents are real, then electrically speaking, what would stop anything from glowing. It doesn't mean it will absolutely glow, or the current is appropriate, or something else might or might not happen. so the string of beads has quite a electrical and even biological feel to it. How else could they be explained? Webbman wrote: all I'm saying is that any object placed in an electrical current can glow. It can also blow up, be ejected, be avoided, or do nothing. The entire safire project is a glowing object in an electrical current. aka star. If that is all you are saying then it needs to be expanded on, especially with the statement, "or do nothing". There is a hell of a lot of stuff in nature that insulates against electrical current. In fact, the majority of objects in nature are natural electrical insulators. They would prevent electrical current from even flowing, meaning the "do nothing" is quite the encompassing statement. In fact, without electrical insulation there would be no functioning electrical grid. In fact, any talk of electric universe without talk of electric insulators is not talk of it at all, it is a haphazard activity with which abstraction into the clouds occurs without substance. Webbman wrote: How else could they be explained? Plasma recombination. The hydrogen plasma is becoming gaseous matter. The hv is plancks constant multiplied by the wavelength (which means light production). The reason why plasma is being recombined is because the gravitational field is so strong. The matter is constantly falling back into the Sun at such high velocity it is ionized on its way down, then recombines producing light. Plasma recombination is a basic phase transition. 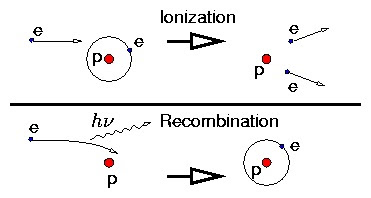 In the diagram below it is called "deionization", same thing. After many years of cooling and mass loss, the star shrinks and ceases its ability to produce strong visible light spectrum, because the gravitational field is too weak. A weak gravitational field means the matter can no longer get ionized, so it remains a mostly neutral gas, they call these stars "gas giants". The gas then goes though more phase transitions and experiences a host of different energy transformation processes and becomes the "planet". It is a very slow process that takes billions of years. The Real Age of Teide-1 according to stellar metamorphosis. Webbman wrote: If you look at it from a biological perspective things really need to be born, and while you might not think this applies to stars or planets, it does definitely apply to you, so there is no reason to believe you are exclusive to the universe. things are born, and we see it all the time. that being said , none of you sees the solar wind the sun is pushing out and a sort of nourishing milk from the mother. Its full of things a new planet might need to grow, and there's even an umbilical cord in the form of the solar circuit. Certainly if your being bombarded by protons, electrons and energy you will likely gain mass even from this. I'm not discounting the capture of planets, but isn't it just more reasonable that the sun gives birth to planets and nourishes them with its light, solar wind and mass ejections. I know most see the universe as a dead material clock work, but that's not what I see. I see a vibrant sun with many feeding youngsters, and a few almost ready to leave the nest, draw on the galactic current, and fly on their own. Each one unique in its own right. I like exercises like this because I can find basic principles which explain these objects, which the prevailing ideas cannot. The Sun is mostly hydrogen. Mercury is mostly iron. How exactly does a mostly iron object come out of an object that is mostly hydrogen? It is simple. It did not happen. I have overviewed a simple principle that explains that a mostly hydrogen object large like the Sun becomes a mostly iron object that is a lot smaller. "As stars evolve into rocky, differentiated worlds, the ratio of lighter elements to heavy elements diminishes considerably." The tiny bit of iron the Sun has that which does not get ejected sinks to the center as it cools and dies (evolves). We can see these intermediate stages of star's evolving by looking into outer space with telescopes. As well, I have placed all these stars on a simple graph. You will see that the Mercury type objects are extremely old, dead stars. Unfortunately this also means that since Mercury type dead stars are extremely old, they could not have been ejected from much younger objects such as the Sun, nor could have any of the really old objects such as Earth, Venus, Pluto, Neptune, Uranus, Jupiter, Saturn or Mars could have come from the Sun, because they are vastly older. A young hot object forming objects that are older than itself? That is a contradiction explained in the terms of the "birthing" as you stated above. To state that they were "birthed" from the Sun, would be like saying a 1 year old baby could give birth to a 100 year old woman. I have tried to teach electric universe people this, but still not a single mention in any youtube video or statement. It is as if the discovery never happened. This is the plight of major discoveries I have learned. The current paradigm ignores it and hopes that it disappears. Too late for that. It is here to stay, forever. Personally, I do not believe all planets were "born" from an ejection process, especially gas giants. However, it might be hard to explain how could very small objects like moons, with sometimes very different or simple compositions (some being almost only iron or a different mineral) from the surrounding planets and especially its host, could have evolved from a star in the first place and going through the complete process. That's where I believe ejection could come into play. I call them failed cores. Cores that were misaligned in some way at a early stage, without acquiring complexity, and being ejected from the star. In this theory it is easy to form smaller objects. A gas object that gets ripped apart too quickly would not have enough time to form a large object in its interior. It would deposit very little before the thick atmosphere is ripped away. JeffreyW wrote: In this theory it is easy to form smaller objects. A gas object that gets ripped apart too quickly would not have enough time to form a large object in its interior. It would deposit very little before the thick atmosphere is ripped away. First thank you for asking the question. It does help me considerably to review and hone the theory when people as me questions concerning it. Orbiting too close to a hotter star. Think of a pot of water on the stove. The water will boil away if it is on the stove and it is hot and burning. "The masses of stars are independent of each other when they are first formed/born." "The mass of a star is partially dependent on its host during its evolution if the orbital parameters can cause mass loss of the companion." principles are provided to explain that mass-dependence attributed to formation processes is moot. massive the objects are which orbit their hosts they will be able to somehow explain how they formed. host life on its surface.